Spies, assassins, surveillance, and sudden death are business as usual for the Special Branch of London's Metropolitan Police. A classic British drama from the 1970s, this gritty police procedural focuses on the veteran cops and brash newcomers dedicated to stopping terrorism and countering espionage in the nation's capital. Featuring an exceptional cast including George Sewell (Tinker, Tailor, Soldier, Spy), Patrick Mower (Callan), and Richard Leech (Doctor Who). "Hard-hitting"--Scotsman (UK). 13 episodes, 11 hrs, 4 DVDs, SDH. Mature audiences. DCI Alan Craven arrests a smuggler at Heathrow Airport, only to find himself accused of taking bribes. Things go from bad to worse as an internal investigation uncovers a questionable deposit in his bank account. Suspended from duty, Craven must clear his name or face criminal charges. Craven is on a stakeout with ambitious new Special Branch colleague Haggerty, and tensions mount steadily. Haggerty believes Craven is hunting for a suspect that's already dead. At the same time, Craven regards the new man as the source of bitter setbacks in his career and life. Craven busts a fraudster for possession of an unlicensed firearm and a forged passport. But while his fellow officers question his holding the seemingly cooperative suspect without charges, the detective ratchets up the pressure to get the information he's really seeking. Haggerty's visiting father, an elderly retired cop, is savagely beaten into a coma in the latest in a series of attacks on travelers. At first the case falls outside Special Branch's jurisdiction, but when sensitive government documents are stolen from the next victim, Haggerty and Craven launch a manhunt for the criminals. Special Branch officers North and Craven are asked to protect a Polish shipping captain who happens to be a former Nazi collaborator. Although they have contempt for the man and for their assignment, they must shield him from those who remember his old crimes. A group of London youths are linked to a series of deadly bombing attempts in the city. With radical connections to the IRA, the Communist Party, and anarchist elements, the group continues in their plot, while the Special Branch team works with an explosives-disposal expert to stop them. A junior defense minister's missing husband turns up dead, fished out of a river in Chiswick. Highly placed people push for immediate investigation of the case, as growing evidence indicates a suspicious cause of death. 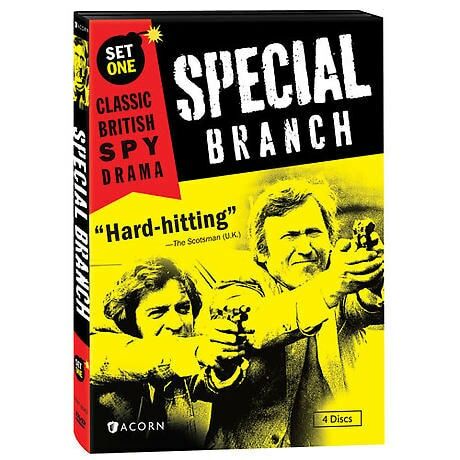 Special Branch must learn if it was an accident, suicide, or murder. When a psychotic ex-CID officer barricades himself and a hostage in a London office building, lacing it with multiple bombs, DCI Craven and the Special Branch team are called in to deal with his demands. Time ticks down as negotiation attempts fail and the man threatens to set off the detonator. An outspoken Hollywood actress born in the U.K. comes to star in a play on the London stage. Acting on a warning from the FBI, the Special Branch officers attempt to protect her from a highly credible murder threat by a group of right-wing extremists. A left-leaning physician is under surveillance as a possible security risk due to connections to foreign governments. Despite accusations of the doctor leaking politically sensitive trade secrets from a former Special Branch officer's business, Craven grows increasingly uncertain that the man is a traitor. A well-off young couple is placed under heavy surveillance shortly after they become engaged to marry. The groom-to-be, an ambitious import/export agent with numerous international ties, has drawn official suspicion through his activities. While Craven is skeptical of their guilt, he doggedly pursues the case nonetheless. The daughter of a German diplomat is kidnapped by a Middle Eastern terrorist group in London. It's up to Craven and Haggerty to rescue her before she gets killed. But time works against the detectives, and events build to an explosive conclusion. A militaristic and unpopular South African diplomat visits London, and the men of Special Branch are assigned to protect him from an anticipated assassination attempt. But DCI Craven worries about Sergeant North's effectiveness and does not find the diplomat's attitude helpful. Rating: NR. Contains strong language.